Chocolate with flower petals, chocolate that excites desire and fantasy, because of chocolate with nuts and raisins, and we have long been accustomed to buy this chocolate can be in any store, а вот шоколад с лепестками розы, Jasmine, lavender or violet – this is truly something unusual. 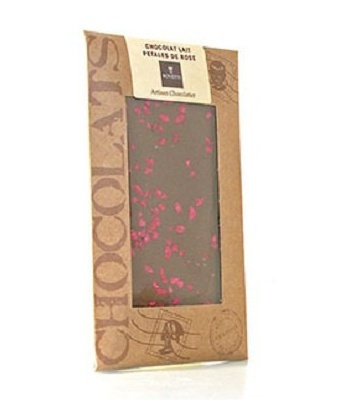 Nevertheless, French company produces several years Bovetti chocolate with flower petals, among them: chocolate with rose petals, Jasmine, lavender and violets. Bovetti company produces chocolate and organic chocolate handmade chocolates, combining traditional and modern methods for the production of chocolate, implementing them under the "Ekoklaster" trademark. The company is based in Bovetti 1994 year at the foot of the French Alps, between France and Italy and offers a dark chocolate with spices, fruit, flowers and seeds, use in the manufacture of chocolate milk is a natural and pure organic cocoa, kopmaniya Bovetti has all the environmental certifications. Bovetti Today the company produces about 150 kinds of chocolate, among which it occupies a special place with chocolate petals, And with flower petals produce milk, bitter and even white chocolate. Petals fall into chocolate bars in the dried and candied form. Taste flowers petals will catch eating chocolate, but the petals emit a very pleasant fragrance. Unfortunately, chocolate with rose petals, Jasmine, lavender or violet is not very common and is available in limited quantities.